Happy Mother’s Day, readers! Hopefully most of you have been able to spend some quality time with your own maternal figures. I just returned from Belize with my mother and mother-in-law (in addition to stepfather, father-in-law, sister, sister’s bf, and husband). I was simply thrilled to share the perfect vacation with perfectly wonderful women. 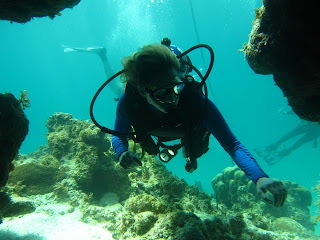 My mom, ever-adventurous, first took me buddy diving in Belize almost two decades ago. 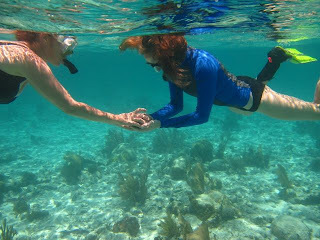 Now certified, I find diving with her both delightful and dear– it’s an activity she has always spoken of highly, and one I dreamt of sharing with her for most of my childhood (dream realized below). She’s done all the great mom things– helped me through horrible times, celebrated the better ones, never, ever, EVER given up on my potential or my happiness. But her contribution to my live is so much more than her role as mother. It is also as teacher, friend, and eager passport-stamper. Indeed, nearly all of what she’s taught me (like how to identify marine exoskeletons, above) has revolved around adventure, travel, and natural science. She used to point out all the constellations and tell me to scuff my feet in the shallows; she made me swear up and down that I’d never night swim in the ocean and taught me how to handle snakes; she assured me that the whole world was worth seeing and saving, and I–ever curious of her globe-trekking footsteps–have tried to follow close behind in order to do so. My mother-in-law is simply awesome. A working mother and wife for over thirty years, she has paved another road for me to follow. Her commitment to family is inspiring and a little intimidating– could I do what she’s done and still have a perfectly level and loving head on my shoulders? I’ve got some time to prepare myself for the adventure of working parenthood, but I’m glad to have another kind of model before me. My stepmother, too, has been a great setter of bars. A ridiculously talented, totally genius architect, she has literally made a mark on our world. She’s shown me how important it is to push myself professionally, even within an extraordinarily difficult field that is far from family-female-friendly. Of course, the mothers in my life are not limited to these three wonderwomen. I am ever-grateful and humbled by the grand feats of my sisters and friends. I feel empowered and encouraged by all of the examples you set the many roads you paved, and the constant, love you show. Until next time, may you find yourselves surrounded by as many good mothers as I.